If you missed my usual ramblings last weekend, sorry but the date needed to stay solemn. I preferred to skip a date. The past weeks have been all about getting into the new school routine, which we are finally getting down and also getting a few things done around the outside house before the colder weather settles in. Not so successful in that area but we got some other overdue projects tackled: Bug has now a proper homework desk in an area where the distractions are limited, I finally hung some artwork on the master bedroom's wall (after almost 7 years in this house ahem ... oops) and we reorganized a few things on the walls of the stairwell and second floor landing. Oh and I finally have a little desk in the office for "overnighters" when I'm on call for work. I will use it for the first time super early tomorrow morning .. yipee!! Bug is still doing wonderfully with her ADHD medication. 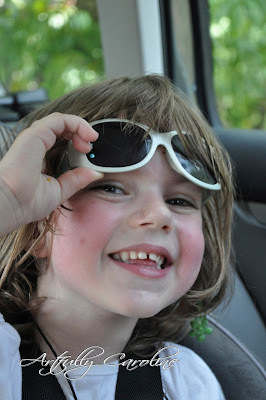 We have a follow up appointment tomorrow morning but I think we are going to continue as is for the moment because not only the side effects are relatively minor, but she is also her happy, energetic and mischievous self, with the ability to concentrate on one task, including at school. Not much done in the studio. I finished a corduroy skirt for Bug and a necklace for me, made a couple of pillowcases as a housewarming present for a girlfriend that just bought a house and started on a little halloween project I'm hoping to finish this week. I still have to take photos so the reveal will have to wait a little. Glad to hear things are going well for you and your daughter. Mine has settled into the school routine as well.